Los Angeles chef David Myers keeps his customers healthy with reimagined brasserie dishes and his staff fit with surfing sessions. While most chefs opening new restaurants gush about their state-of-the-art induction stove or bespoke flatware, David Myers brags that his new West Hollywood spot, Comme Ça, is equidistant—about 30 minutes—from two of Los Angeles’s surfing sanctuaries: El Porto and Surfrider Beach. 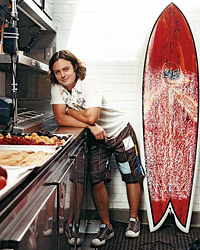 An avid surfer, the F&W Best New Chef 2003 often hits the beach before heading to work. "Surfing is a solitary, meditative activity for me," he says. "I’ve always been committed to exercise, but surfing works your entire body like nothing else." Although he’s known for his spontaneous French-Asian tasting menus at Sona, his flagship L.A. restaurant, Myers will focus on modernized brasserie cooking at Comme Ça when it opens later this summer, supplementing the menu of updated steak frites with healthy daily specials, like melon soup with crab and fennel salad with creamy tapenade. "Brasserie food can be unhealthy, so I wanted to add options for diners who don’t want cassoulet," he says. Myers also makes sure his staff stays in top shape: In addition to building an employees-only gym, he takes them to the beach for surf sessions and full-day Navy SEALs-style training. "Fit cooks are more balanced," Myers says. "And it helps the staff form bonds they can’t make in the kitchen." On wearable activism "I buy a lot of Patagonia products, because the company’s amazing environmental philosophy goes hand in hand with my own" (patagonia.com). On yoga "I attend Bryan Kest’s power yoga classes in Santa Monica. They’re incredibly intense" (poweryoga.com). On chefs’ diets "I used to have just one sit-down meal a day, around 3 a.m. Now I eat more often, and I make sure my staff eats a healthy meal, such as salad or rice, before service." On the perfect sport "I bought a surfboard 10 years ago when I moved to L.A., but it took me eight years to actually start surfing. Once I did, I surfed every day. It completely changed my body structure." Comme Ça, 8479 Melrose Ave., West Hollywood, CA; commecarestaurant.com.